The ultimate in private, luxury homes! Located on the south side of 30a, this house has plenty of room with 6 bedrooms, 4-1/2 baths and spaciously sleeps 21 people. Recently renovated with new furniture, appliances and flooring! Welcome to Playing Hooky on 30a, a luxury home nestled on the south side of 30a in South Walton perfect for large groups, small weddings, corporate retreats, and multiple families wanting to vacation together in paradise! This 3-story home sleeps 21 with plenty of room for everyone! With over 4200 sq. feet of a wonderfully laid out open floor plan, Playing Hooky on 30a offers large bedrooms, upscale furnishings, fully renovated and stocked kitchen, oversized laundry room with extra refrigerator, and three levels of wraparound porches and balconies to enjoy. 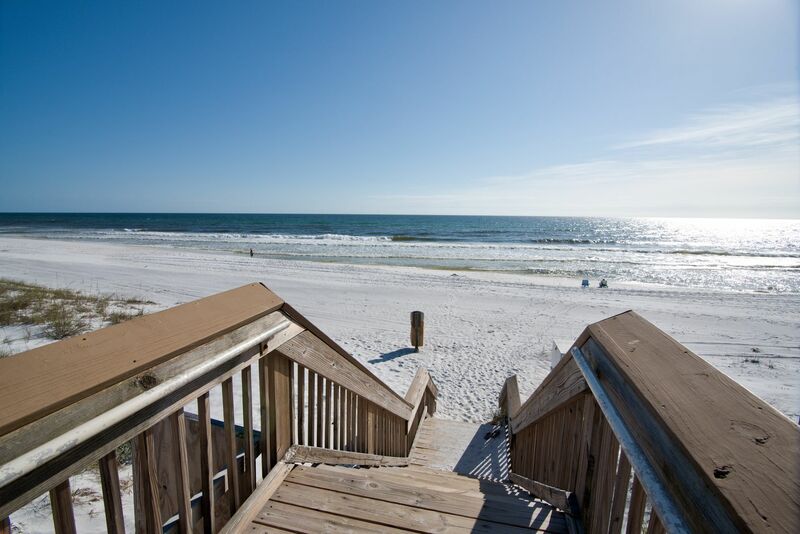 Located just 250 yards to the beach, Playing Hooky on 30a is located in a less crowded section of the South Walton beach, along the bike path, and only a few minutes’ walk to Gulf Place Town Center. A large private pool is surrounded by nature with the pool deck offering plenty of chaise lounges and seating. Upon entering the home, you’ll encounter a completely renovated coastal chic kitchen and living room with new furniture, flooring, 65” SmartTV with DVD player, wine bar, fully equipped kitchen, with plenty of dining seating at a large table and the bar area. Also featured on this floor, an oversized laundry room with extra full refrigerator, and King bedroom with pull out Twin oversize chair and 55″ Smart TV. 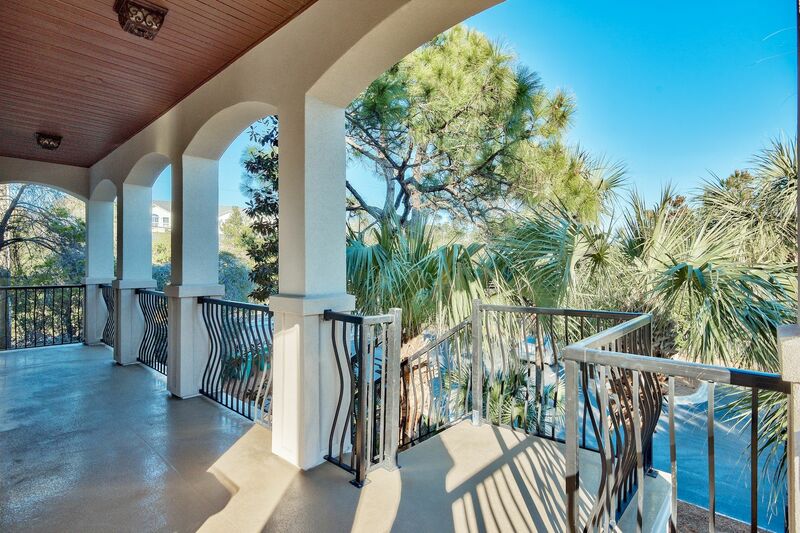 The third story at Playing Hooky on 30a features a huge King Master Suite with a spacious sitting area with pull out Queen sleeper sofa and 55″ Smart TV. The Master Suite also features an en suite bath with large double sinks, stand up shower and Jacuzzi, as well as views of the tranquil 30a scenery. Another King bedroom on the third floor adjoins a full bath. A third bedroom on the third floor has a comfy Queen bed with a Queen pull out sleeper sofa. All bedrooms have wall mounted TVs. The first floor offers access to the pool and pool deck as well as two additional bedrooms. The Bunk Room features two bunk beds with Twins on top and Full size beds on the bottom bunk – with easy access stairs for the top bunk! The other bedroom on the first floor offers a King bed and a large flat screen TV and DVD player. San Remo condominium pool and workout facility access available to you for your stay!! We have beach chairs, pool and beach toys, and a beach cart available at the house. Small dogs considered for an additional $300/dog pet fee (max 2). The pool can be heated for an additional $245+/week.